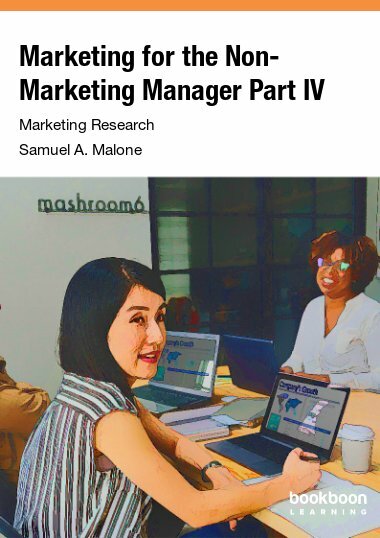 Non-marketing managers need to understand how marketing research is used in the marketing process to determine market size and customer needs and wants. This book fills that need. This is the fourth and final book in a series on marketing. Non-marketing managers need to understand how marketing research is used in the marketing process to determine market size and customer needs and wants. They should understand the difference between quantitative and qualitative research and between desk research and field research. They should be acquainted with the various methods of sampling used in marketing research and about the major role that questionnaires play in the collection of data. This book fills that need. Samuel A Malone is a self-employed training consultant, lecturer and author. He is the author of 21 books published in Ireland, the UK and abroad on learning, personal development, study skills and business management. Some of his books have gone into foreign translations and second editions. He has an M.Ed. with distinction (in training and development) from the University of Sheffield and is a qualified Chartered Management Accountant (ACMA), Chartered Global Management Accountant (CGMA) and a Chartered Secretary (ACIS). He is a fellow of the Irish Institute of Training and Development (FIITD).